На данном уроке мы поговорим о наречиях (Adverbs). В ходе занятия мы узнаем, на какие вопросы отвечают наречия, что они описывают, а также рассмотрим примеры их употребления в речи. Why are you studying English now? Would you like to speak English fluently and know the Grammar rules well? 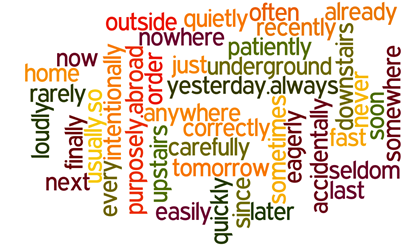 The words “now”, “fluently”, “well” are adverbs. Зачем вы сейчас учите английский? Хотите ли вы говорить по-английски бегло и знать грамматику хорошо? Слова «сейчас», «бегло» и «хорошо» – это наречия. 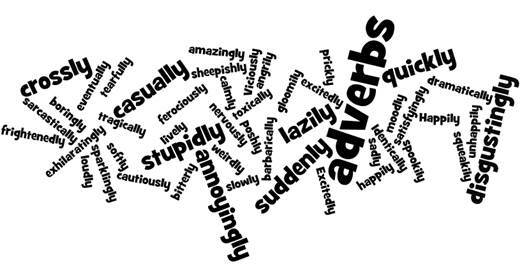 Adverbs describe words but they describe how something happens or is done. They describe actions, NOT people, places or things. 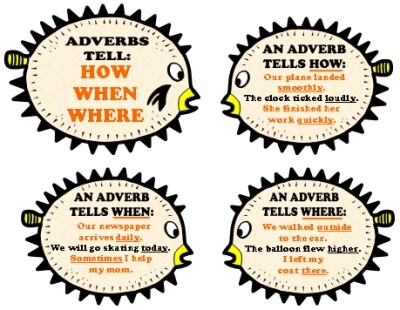 Adverbs describe how, when, where, why, how often or how much something is or happens. 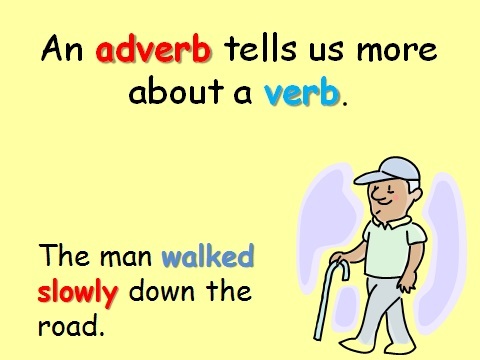 Adverbs tell us more about verbs, adjectives or other adverbs. They answer the questions When? Where? How? Наречия описывают слова, но они описывают, как что-то происходит. Они описывают действия, а не людей, места или вещи. Наречия описывают, как, когда, где, почему, как часто и как много что-то происходит. Наречия рассказывают нам больше о глаголах, прилагательных или других наречиях. Они отвечают на вопросы «когда?», «где?», «как?». How often do you feel? Complete the worksheet and use: always, usually, often, sometimes, never. E.g. How often do you feel amused? – I usually feel amused when I watch TV. How often do you feel energetic? How often do you feel upset after a poor test mark? How often do you feel tired during the week? How often do you exercise at school? How often are you impressed by someone? How does the boy read? Quickly tells how the boy reads. The opera singer sang melodiously. How did the opera singer sing? Melodiously tells how the singer sang. Joe quickly ate three apples. How did Joe eat three apples? Quickly tells how Joe ate apples. Jill suddenly fell on the wet grass. How did Jill fall? Suddenly tells how Jill fell. Таким образом, чтобы найти наречие, необходимо определить глагол (в данных предложениях это слова “reads”, “sang”, “ate”, “fell”) и задать к нему вопрос «как?». Другие примеры наречий: badly, loudly, well, timidly. Read the sentence. Then read the question. Guess which adverb to put on the line. Remember: An adverb is a word that tells when an action happens. Joe ______ reads a book. When does Joe read a book? We will eat lunch ____________. When will we eat lunch? When did Alex feed the dog? She _________ talks on the phone. When does she talk on the phone? He will go shopping _____________. When will he go shopping? Listen, read and repeat the first part of the rock and roll adverb song. All these words are adverbs because they tell us where. They don’t describe a noun. They also tell us how. Remember: An adverb is a word that tells where an action happens. The kids go _____________ to skate. Where do the kids go to skate? You should not skate ______________. There is a skate park ____________. Where is the skate park? I keep my skateboard ______________. Where do I keep my skateboard? Where did the skateboard roll? Because they tell us when. Tells about a verb now? Remember: An adverb is a word that tells how an action happens. How did the boy run? How did the girl talk? How did the wind blow? He _____________ lifted the ball. How did he lift the ball? How did the fire burn? 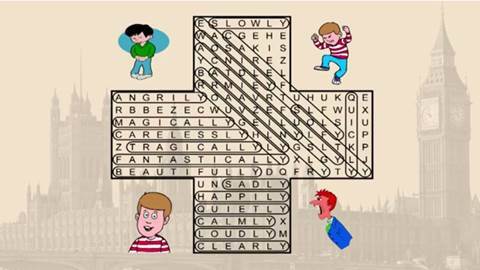 Read the words and then find them in the word search. All these words are adverbs. How is what they’re telling me. 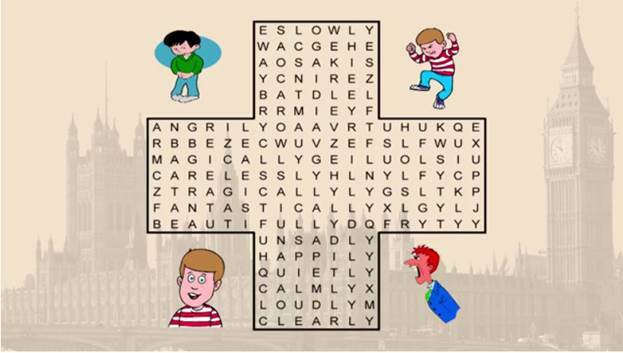 Many adverbs and “ly”, but lots of them do not, e.g. fast, never, well, very, most, least, more, less, now, far, there. You can set your watch by him. He always leaves at 5 o’clock. The dinner guests arrived early. He passed the test easily. That is the farthest I have ever jumped. Поставьте наречие в скобках в нужное место. Образуйте наречия из прилагательных в скобках. They ______________ (warm) smiled at me. This film is _______________ (extreme) funny. She ______________ (easy) finds new friends. They often act _____________ (strange). I am _____________ (absolute) alone. The doctor examined me _______________ (careful). Could you speak ____________ (quiet)? Why are you so nervous/nervously?